Spring is here! We’re just as excited as you are to get back outside and work on all of those exterior home maintenance projects that can’t be done in the winter. Last week we talked about fence maintenance tasks you can do including inspecting, cleaning, sealing, staining and painting your fence. This week, our focus is on aesthetics! Read on for some great fence decoration tips you can use to get your outdoor decorating started this year! Top of the fence looking plain? Add a lattice! Lattice can be purchased as an addition to your fence and creates a unique add-on to any fence. Lattice comes in lots of different materials and designs, so you can find the right one to match your fence. The nice thing about lattice is that it still lets light through, while maintaining an element of privacy. If you’re a gardener, you’ll love this idea. Use a lattice or add hooks to your fence from which you can hang outdoor planters. Let the plants grow over the top of the fence line to create a very unique and natural fence top! Alternatively, add a window box at the edge of a fence for a nice corner design feature. Repainting doesn’t just have to be a touch up in spots where the paint has faded. Go all out with a completely new paint job this spring to give your fence a brand new look. 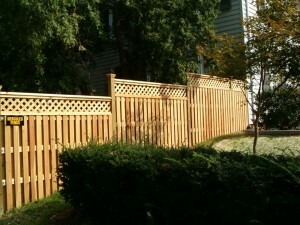 Read our blogs on painting and staining a wood fence for more information. If an ornate look is what you’re after, consider getting an iron gate or adding other subtle iron work. Iron can be custom shaped to create looks ranging from subtle and understated to lavish and bold. Iron is also a very traditional fence material. This is a bigger investment than some of these other projects, but it’s worth it if you’re looking to really add a new dynamic to your fence’s visual appeal. Use stones, tiles, concrete, brick, or pavers to create a walkway that runs along the fence on the inside, framing it against your yard. This border gives the yard a nice finished look and an old-fashioned garden appeal. This entry was posted on Thursday, April 2nd, 2015 at 7:59 pm. Both comments and pings are currently closed.